The Shields of Honor Motorcycle Club is a male only brotherhood comprised of Criminal Justice / Law Enforcement professionals, Fire Fighters, and Veterans of all the U.S. Armed Forces. We are motorcycle enthusiast that work, ride and play hard. We believe in God, family, Job, then Club. We believe in living ethically by a Code that includes things such as loyalty integrity, perseverance, and commitment. We are a 100% law abiding organization with strong American patriotism. We are dedicated to supporting our federal, state, and local law enforcement agencies, our local communities, our country, and the men and women of the U.S. Armed Forces. I am a Shield of Honor! 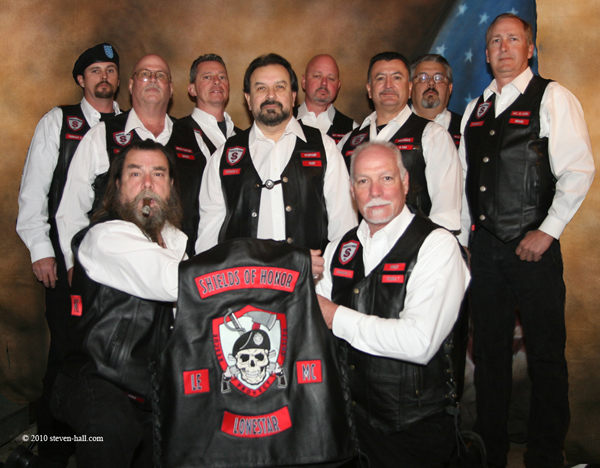 The Shields of Honor Motorcycle Club was founded January 1, 2010. The ten founding members wear the PRIMORIS X patch. (Primoris is a Latin term for First or Foremost, joined with the Roman Numeral X) This patch is to HONOR these men for their perseverance and indomitable spirit demonstrated in the successful creation of this brotherhood. The founding “LONESTAR” Chapter is located in Dallas/Ft. Worth Texas area. The SOHMC patched in the “Low Country” Chapter in the Savannah Georgia Area in June 2011. In April 2012 SOHMC held their first National Meeting in New Orleans, LA. August of 2012 the “Low Country” Chapter elected to changed their name to the “Old South” Chapter. September 2012 the SOHMC – Lonestar Chapter sercured the National Head Quarters and Club House in Dallas, Texas. The Brotherhood continues to grow and support our communities. Our jobs whether as Law Enforcement Officers, Military or Fire Fighters, we Shield and Protect with Honor! Our Colors depict the tools of our trade and our mission. Red and Blue for Police and Fire Department Traditions, Gray for our Southern Heritage.